The Bell UH-1N Twin Huey is a twin-engine medium military helicopter. 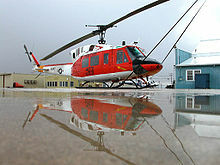 A member of the numerous Huey family, it first flew in 1969. The CUH-1N Twin Huey (later CH-135 Twin Huey) was the original version, first ordered by the Canadian Forces. The UH-1N has a fifteen-seat configuration, with one pilot and fourteen passengers. In cargo configuration it has an internal capacity of 220 ft³ (6.23 m³). An external load of up to 5,000 lb (2,268 kg) can be carried. The UH-1N was later developed into the civil Bell 212. Based on the stretched fuselage Bell 205, the Bell 212 was originally developed for the Canadian Forces (CF) under the designation CUH-1N Twin Huey. Later the CF adopted a new designation system and the aircraft was re-designated CH-135 Twin Huey. The CF approved the development of the aircraft on 1 May 1968 and purchased 50 aircraft, with deliveries commencing in May 1971. The US military came very close to not procuring the Twin Huey. The purchase of the aircraft for US military use was opposed by the Chairman of the House Armed Services Committee at the time, L. Mendel Rivers. Rivers took this position because the aircraft powerplant, the Pratt & Whitney Canada PT6T was produced in Canada. The Liberal Canadian government of the time had not supported US involvement in Vietnam and had opposed US policies in southeast Asia, as well as accepting US draft dodgers. Rivers was also concerned that procurement of the engines would result in a trade deficit situation with Canada. Congress only approved the purchase when it was assured that a US source would be found for the PT6T/T400 engines. As a result, the United States military services ordered 294 Bell 212s under the designation UH-1N, with deliveries commencing in 1970. Unlike in the Canadian Forces, in US service, the UH-1N retained the official name "Iroquois" from the single–engine UH-1 variants, although US service personnel refer to the aircraft as a "Huey" or "Twin Huey". The Bell 412 is a further development of the Bell 212, the major difference being the composite four-blade main rotor. The UH-1N has also been developed into the upgraded, four-blade UH-1Y. The UH-1N's main rotor is powered by a PT6T-3/T400 Turbo Twin Pac made up of two Pratt & Whitney Canada PT6 turboshaft engines that drive a single output shaft. They are capable of producing up to 1,342 kW (1,800 shp). Should one engine fail the remaining engine can deliver 671 kW (900 shp) for 30 minutes or 571 kW (765 shp) enabling the UH-1N to maintain cruise performance at maximum weight. The United States Marine Corps (USMC) modified a large number of their UH-1Ns with a Stability Control Augmentation System (SCAS) which provides servo inputs to the rotor head to help stabilize the aircraft during flight. 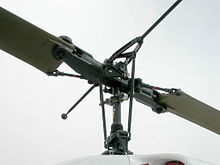 This modification removed the gyroscopic "Stabilization Bar" on top of the main rotor head, instead relying on the computer system for stability. From late 1970, the UH-1N re-equipped the USAF 20th Special Operations Squadron in Vietnam, replacing the single-engined UH-1F and UH-1P. Armed with miniguns (or 40 mm grenade launchers) and rocket pods, and painted camouflage with no US markings and only a Green Hornet insignia, the UH-1N supported Special Forces reconnaissance missions from Cam Ranh Bay. The United States Air Force employs UH-1Ns to fulfill its ICBM mission, providing a utility helicopter for transport between bases such as Minot AFB, Francis E. Warren AFB and Malmstrom AFB to missile launch sites in North Dakota, Montana, Wyoming, Nebraska, and Colorado. The UH-1N is also used by the 36th Rescue Squadron (36 RQS) at Fairchild AFB, WA for conducting Search-and-Rescue (SAR) and medical evacuation missions, as well as the 459th Airlift Squadron based at Yokota Air Base in Japan. During the 1982 Falklands War, the Argentine Air Force deployed two Bell 212s to Goose Green grass airstrip from where they performed general support duties including the recovery of many downed pilots. By the end of the hostilities both aircraft were still intact but were dismantled by the Argentinians. USMC UH-1Ns were used by the USMC during its 2003 invasion of Iraq. UH-1Ns provided reconnaissance, and communications support to Marine ground troops. They were also called upon to provide close air support during heavy fighting in Nasiriyah. In August 2013, the Air Force said they were close to finalizing a plan to sustain and modernize their UH-1Ns for the next six to ten years. The plan was to sustain the fleet, address flight and safety mandates, investigate modest improvements in capabilities, and reduce capability gaps. While the Huey is one of the oldest platforms in the service, keeping the fleet going was seen as having "minimal risk." Fleet-wide upgrades included night vision compatible cockpit lighting, crash worthy seats for flight engineers, and installation of a helicopter terrain awareness warning system and traffic collision avoidance device. The Air Force was also in the process of further acquiring ex-Marine Corps UH-1N models. The Marines were working out a strategy to transfer as many as 26 helicopters to the Air Force to either add them to their active fleet or keep them in reserve. The UH-1N has seen combat service in the Colombian armed conflict. On 16 October 2013, an UH-1N helicopter crashed in the northern La Guajira department. The zone of the crash is a hotbed of FARC rebel activity. The U.S. Marine Corps planned to retire the UH-1N Iroquois by September 2014 after 43 years of service. HMLA-773 (Marine Light Attack Helicopter Squadron 773) was the last Marine squadron operating them, with their last deployment occurring in 2013 where two helicopters sailed on a Royal Netherlands Navy ship for an African Partnership Station deployment. Deliveries began to the Navy and Marine Corps in 1971 totaling 205 UH-1Ns and six VH-1N executive transports for Marine Helicopter Squadron One. The UH-1N was replaced by the upgraded UH-1Y Venom; ten are remanufactured N-model airframes, after which the Marines decided to procure new-built Y-model airframes. Five unarmed HH-1N versions remained in use by the Marines until they were also replaced by UH-1Ys and retired in 2015, the only HH-1Ns remaining from 44 that were converted from 38 UH-1Ns and the six VH-1Ns. The last combat deployment of the UH-1N by the Marines was to Afghanistan in 2010. The Marines retired the UH-1N during a "sundown ceremony" at Naval Air Station Joint Reserve Base New Orleans on 28 August 2014. In March 2013, the U.S. Air Force operated 62 UH-1N Hueys with 25 providing security at ICBM sites, 19 stationed at Joint Base Andrews to evacuate Washington-based government officials in emergencies and 18 used for testing and training. Since most were purchased in 1969, the Air Force had sought a replacement. The first requirements were issued in 2007, but the process was repeatedly delayed. On 24 September 2018, the Air Force declared a Boeing/Leonardo submission of their MH-139 version of the AgustaWestland AW139 the winner, beating out the Sikorsky/Lockheed Martin HH-60U version of the UH-60 Black Hawk and the Sierra Nevada Corporation upgraded UH-60L called the Force Hawk. Boeing was awarded an initial $375 million contract for four aircraft, with 84 helicopters planned at a total $2.38 billion program cost. The first operational aircraft is planned for delivery in 2021. Initial production model, used by the USAF, USN, and USMC. Over the years the primary operators, the USMC has developed a number of upgrades for the aircraft including improved avionics, defenses, and a FLIR turret. The USAF planned to replace their UH-1Ns with the Common Vertical Lift Support Platform to support the service's ICBM activities, but also examined a life extension for their current fleet. A UH-1N replacement and upgrade as part of the H-1 upgrade program for the USMC, designed to coincide with a similar upgrade for the AH-1W attack helicopter to AH-1Z Viper standard, with common engines and other major systems. Original Canadian Armed Forces designation for the UH-1N utility transport helicopter. Canadian version of the UH-1N. Canada purchased 50 CH-135s with deliveries starting in 1971. The aircraft were retired from the Canadian Forces starting in 1996 and struck off strength in December 1999. 41 of the surviving CH-135s were acquired by the US government in December 1999 and transferred to the National Army of Colombia and Colombian National Police. At least one CH-135 was destroyed in combat. 135135 was transferred to the Colombian National Police and flown by the Dirección Antinarcóticos (DIRAN). It was destroyed on the ground by FARC rebels on 18 January 2002, following an incident in which it was forced down by gunfire. Two CH-135s are on display in museums, one at the Canada Aviation Museum in Ottawa and one at the National Air Force Museum of Canada at CFB Trenton. Civil or military utility transport version. Built under license in Italy by Agusta. Electronic warfare version for Turkey. Anti-submarine warfare, anti-shipping version of the AB 212 helicopter, built under license in Italy by Agusta. Operated by the Italian Navy, Hellenic Navy and Islamic Republic of Iran Navy, Peru, Spain, Turkey, and Venezuela. The AB 212ASW is a Model 212 Twin Huey with a prominent radome above the cockpit. Early production had a dome-shaped radome, while later production had a flatter "drum" radome. A left side winch is used for dipping the Bendix ASQ-18 sonar. Other changes include structural reinforcement for a gross weight of 11,197 lbs (5080 kg), ECM, shipboard deck tie-down attachments and corrosion protection. Armament is two Mk 44 or Mk 46 torpedoes or two depth charges in the ASW role and four AS.12 air-to-surface wire-guided missiles for the anti-shipping role. Battleship Memorial Park, Mobile, Alabama, U.S.
UH-1N 159198 – Flying Leatherneck Aviation Museum at MCAS Miramar, San Diego, California. CH-135 Twin Huey 135102 serving with the Multinational Force and Observers Sinai, Egypt, 1989. CH-135 Twin Huey 135137 in the original blue-gray and green camouflage pattern worn by these aircraft prior to 1986/88. CH-135 Twin Huey 135135 in the early-style SAR markings, 1988. This aircraft was serving with Base Rescue Goose Bay and had formerly been assigned to 424 Transport & Rescue Squadron, CFB Trenton. CH-135 Twin Huey 135127 from Base Rescue Goose Bay in the later SAR scheme used after 1986–88. CH-135 Twin Huey 135103 in special flight test markings. The aircraft was used by the Aerospace Engineering Test Establishment at CFB Cold Lake, 1987. 408 Tactical Helicopter Squadron UTTH Flight badge worn by CH-135 Twin Huey crews circa 1990. The badge is based on the shield of the province of Alberta. UH-1N serving with the 1st Helicopter Squadron at Joint Base Andrews. ^ a b c d e f Mutza 1986, pp. 31-33. ^ Air Force Public Affairs / Department of National Defence (6 April 2004). "Bell CH-135 Twin Huey". Archived from the original on 24 September 2012. Retrieved 10 January 2013. ^ a b c d e f g Drendel 1983, pp. 14-17. ^ Drendel 1983, p. 9. ^ Eden 2004, p. 47. ^ Mutza Air Enthusiast December 1986–April 1987, pp. 30–31. ^ "H-83 Bell 212 C/N 30834". Helis.com. Retrieved 2013-01-10. ^ Stout, Jay A. Hammer from Above, Marine Air Combat Over Iraq. Ballantine Books, 2005. ISBN 978-0-89141-871-9. ^ "Se accidentó helicóptero en la frontera con Venezuela". El Colombiano. Retrieved 2013-10-20. ^ "Doce soldados muertos deja ataque de las FARC en Maicao | Nación". Noticiascaracol.com. Retrieved 2013-10-20. ^ "Tres policías muertos en atentado de las Farc en Maicao | 20130201". Caracol.com.co. Retrieved 2013-10-20. ^ Jennings, Gareth (4 September 2014). "UH-1N 'Huey' retired from USMC service". IHS Jane's Defence Weekly. Retrieved December 5, 2014. ^ Boeing wins UH-1N replacement contract from USAF. Flight International. 25 September 2018. ^ Boeing Wins Air Force Contract to Build Huey Replacement. Air Force Magazine. 24 September 2018. ^ "USAF Planning Decade-Long Huey Extension". ^ Walker, RWR (June 2006). "Canadian Military Aircraft Serial Numbers Canadian Armed Forces CH-135 Twin Huey detailed list". Archived from the original on 31 October 2007. Retrieved 2 December 2008. ^ Green, William. Observers Aircraft, p. 229. Frederick Warne Publishing, 1980. ISBN 0-7232-1604-5. ^ Wood, Derek. Jane's World Aircraft Recognition Handbook, p. 490. Jane's Publishing Company 1985. ISBN 0-7106-0343-6. ^ a b c d e f g h i j k l m n o p q r s t u v w x y z aa ab ac ad ae af ag ah "World Air Forces 2018". Flightglobal Insight. 2018. Retrieved 16 June 2018. ^ "Bell CH-135 TWIN HUEY". canadianwings.com. Archived from the original on 1 February 2014. Retrieved 21 January 2014. ^ a b Air Force Public Affairs / Department of National Defence (24 March 2010). "403 Squadron Activated as Operational Training Squadron". Archived from the original on 20 April 2013. Retrieved 10 January 2013. ^ Air Force Public Affairs / Department of National Defence (22 September 2011). "408 Tactical Helicopter Squadron (THS) History". Archived from the original on 20 April 2013. Retrieved 10 January 2013. ^ Air Force Public Affairs / Department of National Defence (31 August 2010). "424 Squadron History". Archived from the original on 13 November 2012. Retrieved 10 January 2013. ^ Air Force Public Affairs / Department of National Defence (28 November 2008). "History of 427 Special Operations Aviation Squadron". Archived from the original on 2 September 2012. Retrieved 10 January 2012. ^ Air Force Public Affairs / Department of National Defence (28 November 2008). "430 Squadron". Archived from the original on 22 May 2013. Retrieved 10 January 2012. ^ a b Air Force Public Affairs / Department of National Defence (11 April 2012). "444 Squadron History". Archived from the original on 29 September 2012. Retrieved 10 January 2012. ^ AEROWAREdesigns (2012). "Utility Squadron VU 32". Archived from the original on 6 August 2012. Retrieved 10 January 2013. ^ Air Force Public Affairs / Department of National Defence (3 April 2012). "417 Combat Support Squadron - History". Archived from the original on 13 November 2012. Retrieved 10 January 2013. ^ "Israel Air Force - Aircraft Types". aeroflight.com. Retrieved 22 January 2013. ^ "Jamaica Defence Force Aircraft". jdfmil.org. Retrieved 26 January 2013. ^ "30 Years of Helicopter Operations". mindef.gov.sg. Archived from the original on 29 July 2013. Retrieved 22 January 2013. ^ "Final Flight of UH-1N Huey for HMLA-773". helihub.com. Retrieved 3 September 2014. ^ ""Huey" Helicopters Fly Final Flights for the U.S. Navy". ktvn.com. 6 Apr 2009. Retrieved 20 January 2013. ^ "US Navy Retires The Huey". DTN News. Retrieved 20 January 2013. ^ Canada Aviation and Space Museum (2018). "Bell CH-135 "Twin Huey"". Retrieved 9 August 2018. ^ USMC (4 September 2008). "USMC UH-1N fact sheet". Archived from the original on 16 June 2007. Retrieved 14 October 2012. ^ Frawley, Gerard. The International Directory of Military Aircraft, p. 33. Aerospace Publications Pty Ltd, 2002. ISBN 1-875671-55-2. Chant, Christopher. Fighting Helicopters of the 20th Century. Graham Beehag Books, Christchurch, Dorset, England, 1996. Debay, Yves. Combat Helicopters. France: Histoire & Collections, 1996. Drendel, Lou. Huey. Squadron/Signal Publications, Carrollton, Texas, 1983. ISBN 0-89747-145-8. Eden, Paul. "Bell 212/412". Encyclopedia of Modern Military Aircraft. London: Amber Books, 2004. ISBN 1-904687-84-9. Francillon, Rene, J. Vietnam: The War in the Air, New York: Arch Cape Press, 1987. Hoyle, Craig. "World Air Forces Directory". Flight International, Vol. 182, No. 5370. pp. 40–64. ISSN 0015-3710. Mesko, Jim, Airmobile: The Helicopter War in Vietnam. Squadron Signal Publications, 1984. Mutza, Wayne. "Covertly to Cambodia". Air Enthusiast, Thirty-two, December 1986–April 1987. pp. 22–31. ISSN 0143-5450. Mutza, Wayne. UH-1 Huey in action. Carrolton, TX: Squadron/Signal Publications, 1986. ISBN 0-89747-179-2. Mutza, Wayne. UH-1 Huey in Colors. Carrolton, TX: Squadron/Signal Publications, 1992. ISBN 0-89747-279-9. Wikimedia Commons has media related to UH-1 Twin Huey. This page was last edited on 12 February 2019, at 17:04 (UTC).